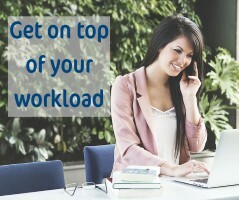 5 ways to work wonders with your workload! When you have a small business it can sometimes seem as though you are so busy with your daily workload that you never actually have the time to do the work that you really love doing. Calls, emails, meetings and ‘to do’ lists stretch before you but when are you going to find the time to get everything done? I like to think I am an expert in clever workload planning and, whilst I can’t add a 25th hour to the day, if you follow my advice I can give you more time and help you to feel on top of your workload. If you dream of becoming effortlessly efficient, here is my guide on how to get things done! If you have client calls and meetings spread throughout the day it can often mean that timewise the whole day is a workload write-off. If you take into account travel between meetings and follow up notes you are often left with very little time to get anything useful done throughout the rest of the day. So what’s the solution? I find that by setting specific dates that you are available for one to one meetings and calls you can then schedule them back to back to make the most efficient use of your time. By holding meeting in ‘blocks’ you’ll get a nice block of clear time each day too. It’s also a good idea to schedule your meetings for the same venue or town if possible so that you don’t waste time travelling, and don’t be afraid to make use of technology such as Skype or conference calls either as these can be great time savers too. In a busy day it’s often tempting to take 5 minutes here and there to work on a bit of admin or take a quick look at your accounts. However we know that 5 minutes easily adds up to 50 and before you know it the avalanche of administration has taken over your day! I recommend that you schedule specific dates and times to work on administration or accounts. You’ll then know that you have the time in place to really focus on what you need to do and, because you can concentrate more at these scheduled times, you’ll probably spend less time on it and end up achieving much more too. An effective to-do list is vital for any small business. It lets you see what needs doing and when it needs to be done, but it’s also very easy to waste time constantly checking and re-doing your list. So don’t let your to-do list get out of control! In order to tame that to-do list I recommend that you allocate specific time each week to work on it, and any working tasks should be scheduled in to your diary instead. I advise spending around 30 minutes 3 times a week managing your list – as from my experience this allows you to really keep on top of your workflow. When you’re in control of your to-do list you’ll be free to concentrate on other areas of your business whilst feeling that you are aware of your priorities for the coming days. When working with clients and planning your week it’s often all too easy to think that you have more time available than you actually have. It’s lovely to open your diary to see that you have lots of free time, but look again because that time might not actually be free after all. For example you might book an hour long meeting with a client but have you allowed for the fact that it takes 30 minutes to travel to their office (and back again)? Or you might have a 30 minute call but don’t forget that you’ll need to do an hours research and planning beforehand. Being realistic with your time means that you will be able to plan your workload far more effectively and that you won’t feel under pressure to squeeze more in. So, every time you put something in your diary think about the hidden timing involved whether it’s travel, admin, preparation for meetings or follow up calls and make that sure you schedule them in too. To achieve maximum efficiency it’s a really good idea to start a small time and motion study of how you work. For 1 week keep a note of the tasks you are doing in a day and how long they take. This can be a revelation for many small businesses. You’ll find out where you might be wasting time or duplicating your effort. This can also help you to understand where could automate some tasks, or be better off outsourcing work to free up your time for other (more enjoyable) activities! By using these simple strategies you’ll soon be working to maximum efficiency. With more structure to your diary and a clearer view of your workload you’ll find that you are under less pressure and have time to do the work that you love to do, or be able to take a little extra time off now and then. If you need some help becoming more efficient with your workload, book a free call with me and let’s have a chat about what you do, what you would like to achieve and see how we can work this out.